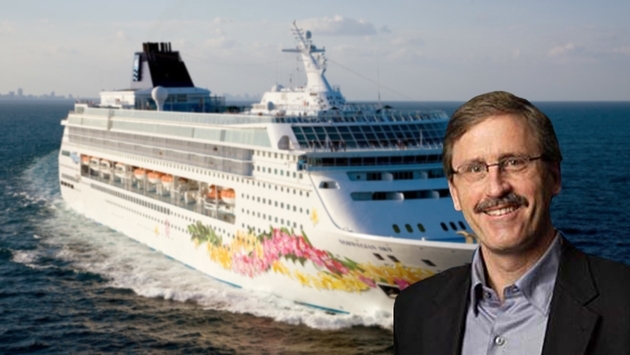 In his first virtual meeting with travel agents, new Norwegian Cruise Line President and COO Drew Madsen likely won them over. He revealed he used a travel consultant when he booked the three cruises he’s taken. Madsen was introduced to the trade during a webinar hosted by Andy Stuart, executive vice president of global sales and passenger services. Madsen has been on the job since Oct. 13, joining Norwegian after most recently serving as president and COO at Darden Restaurants Inc., parent company to restaurant brands including Olive Garden, Yard House, LongHorn Steakhouse and Capital Grille. He was hired to run the cruise line shortly after Norwegian’s parent company announced its pending purchase of Prestige Cruise holdings and its Oceania Cruises and Regent Seven Seas Cruises. Interestingly, two of the cruises Madsen has taken were on Oceania to Alaska and Regent in the Baltic Sea. The first was Disney Cruise Line when his now 22-year-old twins were young. Madsen was at Darden when it became the first restaurant company named one of Fortune’s “100 Best Companies to Work For.” It was a goal to make that list, Madsen said, especially after failing for the first three years it applied. A Detroit native who also spent many years at General Mills, Madsen said he has “enormous respect” for the transformation and growth that has taken place at Norwegian since 2008. His goal is to continue developing the company’s innovations — such as The Haven suite complexes, the Waterfront restaurant district, and branded entertainment — to create a “highly satisfying” and memorable experience that also is a great value to vacationers.